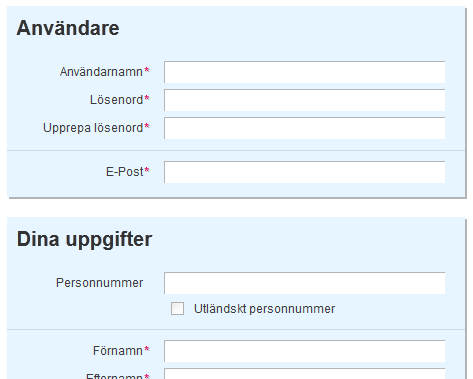 I am working on a massive user registration form for a web application for my company. We have been discussing different ways of alerting the user that a field is required for registration. 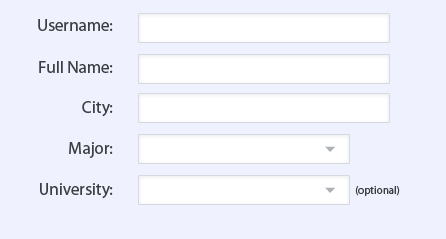 As of right now I have suggested to use a dashed bottom border on the labels of the required fields. I have tried to make the text bold or adding an asterisk (*) after the label, but I found that it just cluttered the whole thing down. I choose to make it dashed to differentiate it from links which are underlined on the site. It is important that the form remains solid and keeps its rigid look and the regularity of the different labels are crucial in doing so. I have an explanatory text that tells the user that the dashed labels indicate a required field. My question boils down to this: Is this okay from a user experience point of view? Are there any other recommended practices for solving this, given the above requirements for regularity and ease of reading? I have placed the asterisks on the left hand side of the labels in order to make the whole thing more readable. After a lot of good comments on where to place the asterisks I finally decided to place it on the right hand side. It took some time getting it to look good and maintaining the right adjusted column. 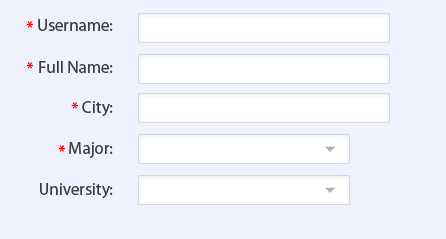 Though I know you are not a fan of using the standard * as a way to highlight mandatory form fields ,I would strongly urge you reconsider your decision .The reason being that having the * (in front of the label or field) has become some what of a de-facto standard with regards to a form field being mandatory and coming up with a new design might just confuse people about whether its mandatory or not. Another alternative is that you explicitly mention that a field is required but then since you said your form is already pretty large,you are just adding more repetitive text. if the fields are the same width, users will be able to scan the form quickly. When deciding on which fields to require, take into account the total number of fields in the form. 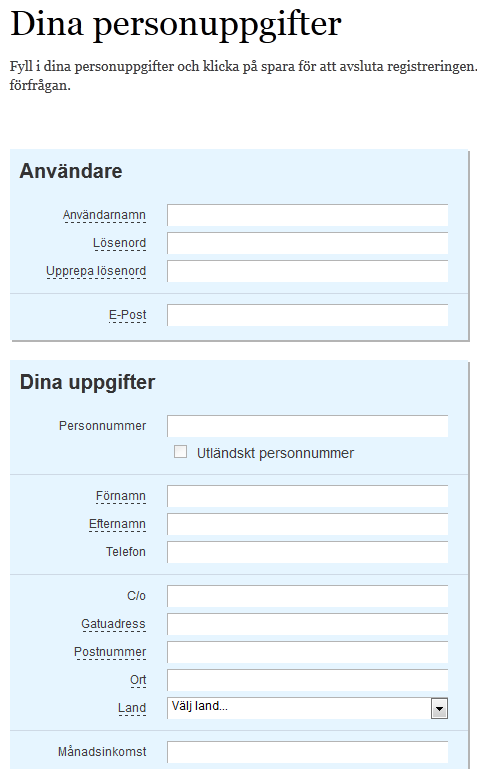 If the form is complex and most of its fields are required, the user will likely see it as unnecessary clutter. Dotted Underlines are usually rendered using <abbr> which signifies an abbreviation with the full un-abbreviated text displaying as a tooltip. Your route may work provided there is a tooltip available when hovering over the dotted-underline text, saying 'Required Field' or even better to give a full breakdown of that field information: "Please enter you address (Required)". see W3 example for details of this tag. If you are going to break from the norm then you need to provide the user with as many clues as possible to keep them in the picture. There is an accessibility issue to consider. Screen-readers can read out "asterisk" or "star" but are more likely to have trouble with dotted-underlines. This may be one reason to use an image of a star with appropriate alt text to be read out, "You need to enter this information". Conventions can be bended, but there must be a really good justification for bending them. In other words, unconventional approach should provide truly superior solution in order to be worth of breaking conventions. The edited approach with asterisks is much better. I have no issue with doing things differently, as long as there is some benefit. I do have a problem with the underlines though, because they are visually very distracting. It does make it harder to read ( not that I can read Dutch [?] anyway ), because it is too closely associated with the text. The advantage of the asterisks is that they are visually detatched, so it is easier to see "fields that are mandatory" and "this field title". If most of the form fields are optional then it would be better to mention the required ones. The dotted lines give me the impression that there is a tool tip with a description there. I would go with a combination of an icon or symbol next to the label (e.g. [*] or [req] icons) together with a different background for the input controls (e.g. yellow instead of white). Create a backout effect on the entire webpage, leaving just the form as enabled. put a blinking effect behind, enough that it should not impact the ux wrongly. From your form fields, most of the fields are mandatory. 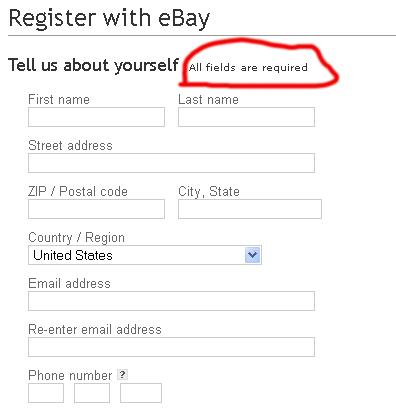 So you can specify "All fields are mandatory" anywhere in the common place (may be @ top). Then you can say "optional" for others. NOTE: From your design, underline always looks like some help text will be shown while mouse hover it ( or ). Not the answer you're looking for? Browse other questions tagged forms usability web or ask your own question. What's the best way to highlight a Required field on a web form before submission? Is it bad practice to mark a field as required but not really require it? How should I align field “format” markers? Have I missed anything from my list of web form best practices? Should “gender” be required, or is there a better way to collect this information? CMS: Best way to arrange a large number of fields? If everything is clickable, nothing is clickable - how to improve text links? Does Material Design have a guideline for grouping/organizing many form fields?